- Over the recent years, disposing of your construction waste has become a lot more expensive. Landfill levy rates have increased in WA from $8 per tonne in December 2014 to the current $70 per tonne. Rather than allowing waste to become an increasing cost, you can choose equipment that help you reduce the waste volume and recycle the waste on site. One example is the ALLU Transformer bucket that is a screening, blending, mixing, sorting and sieve bucket and in the right application can also be used for light crushing. With a range to suit everything from skid steers to loaders and excavators, the ALLU can process and reuse construction waste on site. It utilises a patented system of rotating shafts with blades, giving it unique features, such as being able to handle wet product and reduce particle size. 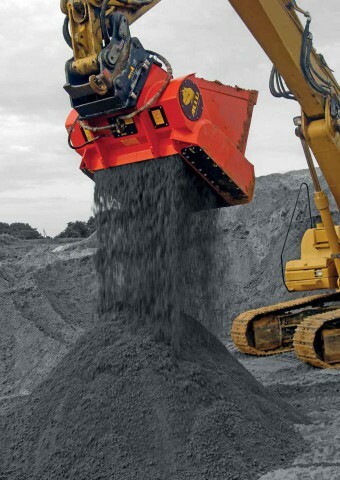 The ALLU also does not require shaking of the machine (like a screening bucket), and hence has much greater control and is much safer for your machine, operator and surrounding environment. It is common practice to remove fill from site, then to bring clean material back to achieve required compaction etc. This means you are paying $70/tonne in disposal costs, $2–$3/kilometre to run your truck to the waste facility, then you buy clean fill and again pay $2–$3/kilometre to bring product back to your site. This also involves considerable use of valuable time on your project. By using an ALLU Transformer bucket, you can process your existing fill on site, thereby eliminating most of the above costs. If the material cannot be used on site, you still take it to the tip but with improved efficiency. Think of how many truck-loads you can save if the product is more compact, reducing the air space in each load? By investing in an ALLU, you can have substantial rewards. Feed materials that are transformed into valuable products will result in substantial savings in material, the need for transportation of waste or replacement materials will be minimised and reduced number of process steps will save you time. There are environmental benefits too, from reduced emissions and less waste products. Experience the performance of ALLU Transformer bucket for yourself by scheduling a demo*. *Demo bookings are limited to industry professionals and operators. Qualifying criteria apply. With increasing waste disposal costs, an ALLU Transformer bucket could save you both money and time.